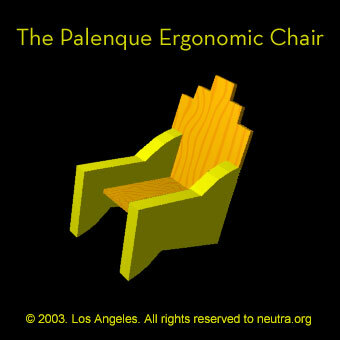 The Palenque Chair is an inspiration from the Pakal's Lid found in the Temple of Inscriptions in Chiapas, Mexico. It includes technical and metaphorical considerations found in the analysis of King Pakal's depiction toward his ascension as a Mayan God. From the Lid, we can extract technical data on how Pakal sits to design a chair that meets the requirements of a modern easy chair. The drawing at the top establishes guidelines that are primarily intended for relaxation and comfort - qualities which are highly personal. Nevertheless, the drawing offers some basic dimensions for use in making preliminary design assumptions. The following design suggestions were taken in considerations for the analysis: (1) the angle formed by thighs and trunk should not be less than 105 degrees. Angles significantly less than this will cause discomfort; (2) design should allow the user to adjust lumbar posture; (3) the front edge of the seat should be rounded to prevent irritation; (4) the seat surface should tilt backwards. Too severe an angle, however, may cause a person difficulty in getting up from the chair, particularly for elderly people; (5) a seat angle of about 15 degrees should be adequate; (6) if the angle formed by the backrest with the vertical exceeds 30 degrees, provisions for a headrest will be required in the form of a separate design element or extension of the backrest itself; (7) armrests should be designed horizontally or at the same angle as the seat surface with certain considerations of elbow support. The geometrical forms used in the design provide an allegory for universal harmony and infinite awareness. The vertical and horizontal components have been carefully eliminated to emphasize the overwhelming idea of ascension as in the Pakal's Lid and avoid gravity awareness in space. The design proposition includes shape symbols that are familiar in the Mayan culture by association of general ideas.